Starring Joaquin Phoenix, Jonah Hill, Rooney Mara, Jack Black, Tony Greenhand, Beth Ditto, Mark Webber, Ronnie Adrian, Kim Gordon, Udo Kier, Carrie Brownstein, Ethan Tindukasiri, Sunny Suljic, Cree Kawa, Nolan Gross, Leo Phoenix, Emilio Rivera, Ken Tatafu, Angelique Rivera, Rebecca Rittenhouse, Anne Lane, Jessica Jade Andres and Gus Van Sant. Screenplay by Gus Van Sant. Distributed by Amazon Studios. 114 minutes. Rated R.
If you Google the image that goes with the title, you get a cartoon portraying a wild west scene, with lawmen on horseback, and a lone wheelchair sitting in the brush. It’s funny and ironic; the humor of John Callahan, legendary cartoonist for the Willamette Weekly in Oregon. Callahan took up cartooning later in his life, as a recovering alcoholic confined to a wheelchair after a car crash. Don’t worry, he won’t get far on foot tells Callahan’s story, chronicling his journey from his last day walking, his battle with alcoholism, and his epic battle through to sobriety. It is an irreverent tribute to the twelve-step process, told with the humor that only a character who has experienced rock bottom can tell. Joaquin Phoenix adds yet another stunning performance to his resumé with his portrayal of Callahan, a performance that I feel likely will garner nods during awards season. Phoenix plays dangerous, dashing, and devil may care better than any other actor out there today. However, that is only Callahan in his early years. After the crash, Phoenix shows his range and versatility portraying Callahan’s vulnerability, pain, disability, depression, while maintaining the flare and irreverence. Upside down on his Stryker frame, a torture device found in early rehab facilities (along with the iron lung), he met and captivated his future girlfriend, Annu (played by Rooney Mara). Later, once able to progress to a bedridden state, he charms the pants (literally) off his nurse while they test his remaining sexual abilities. Still, what appears to be a forced end to the alcoholism is just a break, and he returns to the bottle from his wheelchair. In a hard-to-watch series of scenes about the power of alcoholism on its victim, Callahan hits his low point. That leads him to start the 12-step process and helps introduce him to the peers that help him get his life back in focus, including his sponsor Donnie (played by Jonah Hill). While my summary is fairly linear, the film is not. It tends to bounce around all over Callahan’s timeline – perhaps to break up some of the more difficult, serious periods in Callahan’s life? I would be interested to see how much of the bouncing was from the book versus writer / director Gus Van Sant’s decision. There was a scene – I’ll call it the blue scene – that was a breakthrough painful moment in Callahan’s 12-step process, where everyone in the group was wearing variations on navy blue. It made me want to go back and watch the movie a second time to see if these color themes were added in other scenes. If they were, I was too engrossed in most of the movie to notice. Of note, a read-through of the credits gives life to yet another story, that of a film at least 20 years in the making. Callahan passed in 2010, but in the end credits of the film, we find that the film’s story was co-written by Callahan and Van Sant, based on Callahan’s book, with screen play written and directed by Van Sant. Further in, there is a tribute to Robin Williams, and with further digging, we find that Williams optioned the story to make into a film 20 years ago. My hope is that there is more to this story yet to be told. Copyright ©2018 PopEntertainment.com. All rights reserved. Posted: July 20, 2018. 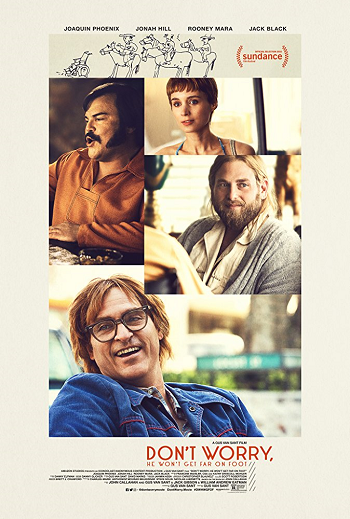 Tags: Angelique Rivera, Anne Lane, Beth Ditto, Bonnie Paul, Carrie Brownstein, Cree Kawa, Don't worry he won't get far on foot, Emilio Rivera, Ethan Tindukasiri, gus van sant, Jack Black, Jessica Jade Andres, Joaquin Phoenix, John Callahan, Jonah Hill, Ken Tatafu, Kim Gordon, Leo Phoenix, Mark Webber, movie review, Nolan Gross, PopEntertainment.com, Rebecca Rittenhouse, robin williams, Ronnie Adrian, Rooney Mara, Sunny Suljic, Tony Greenhand, Udo Kier. Bookmark the permalink.